Hello everyone - being new here, I hope I am in the correct section for this topic. I was given a very damaged sulfide marble at my show recently and was asked to see if I could "fix" it. 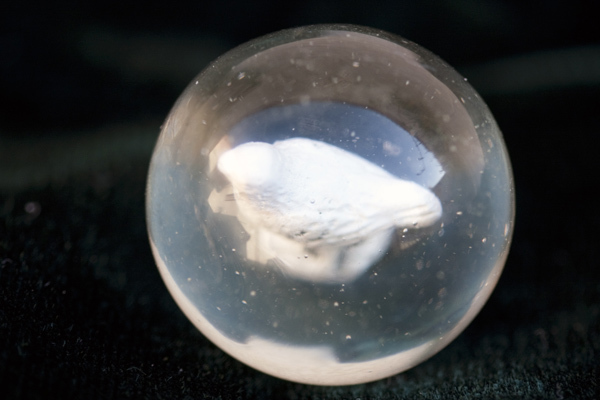 Here are 4 before pictures - notice, one can't even tell what the little figure is inside the marble! Wow, what a difference! That's amazing. Wow Rich!! That looks great!!! First off... Welcome!! And, don't worry about what is posted where... We do have sections for various topics... Including one on repair work... But, had you posted there, not many would have seen this. Steph would probably have moved it here to get more attention. So, when in doubt, post in this section. As the topic slows down, it will be moved to the right forum for archive. We're not "strict" here and no one should feel worried about being reprimanded for posting something in the "wrong" place!! 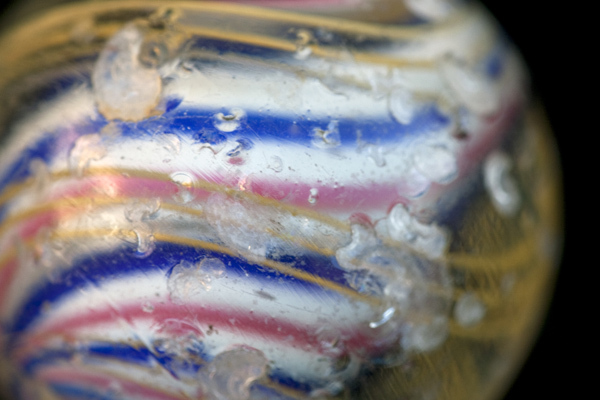 Could you tell us a little about yourself and your history with glass work?? Have you been doing this sort of thing for a while? I, for one, have been very curious about this process and I really hope we all have the opportunity to learn about it. Whether it's something you support or not, it exists... Let's learn about it, rather than chasing it back under the rug!! We do have sections for various topics... Including one on repair work... But, had you posted there, not many would have seen this. Steph would probably have moved it here to get more attention. hehe, I did move it Sue. lol. It was in the restoration forum so I moved it but I left a link so I could move it back when it ran its course. Me too. I've heard people asking, and kept waiting with great interest for an answer. But never got a clear idea. That really is an impressive fix. I didn't even know such a repair was possible - outstanding work I'd say. Ok everyone. 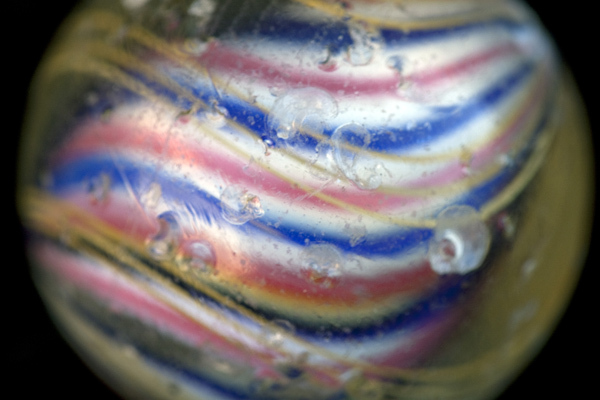 I have been torching (lampwork NOT glass blowing) for about 9 1/2 years now with emphasis on marbles for the last 3 1/2 years. I ran the 4th annual Orange County Marble Show on March 20th and the show seemed to be a great success for m,any of the 43 vendors that sold their goodies there. I plan on running the 2011 show and I'll let you guys know more later. 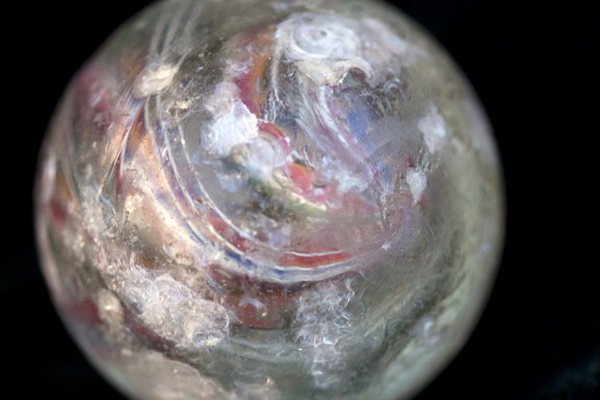 I have just received 40 pounds of Fenton glass (as seem with the show, Dirtiest Jobs where the Jabo people took waste glass and made machine marbles from the glass). 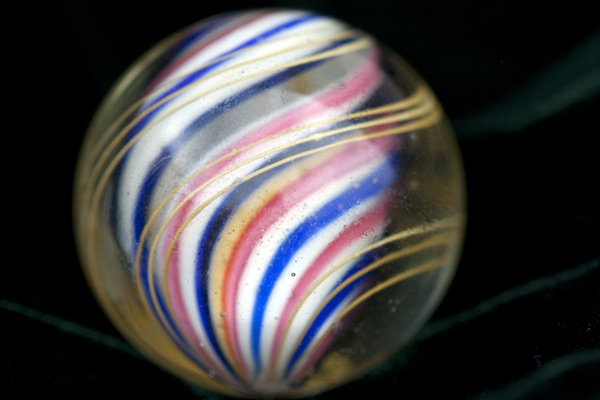 Today, I made 2 handmade marbles (the second one is in my kiln as I type...lol). 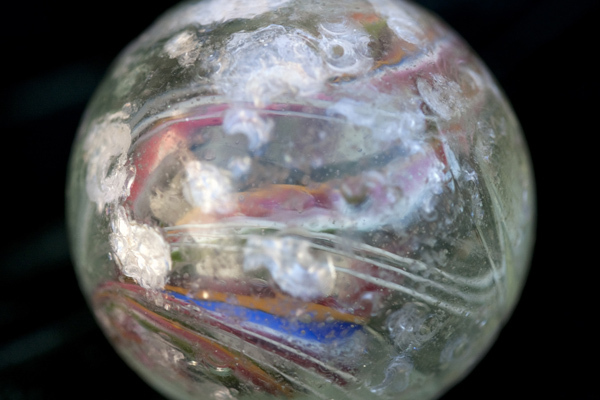 I am enjoying the blend of vintage and contemporary marbles at the show and I was taught SO much by the collectors there. I am looking forward to a long and happy relationship here with you guys and I plan on sharing the art here with you guys too. 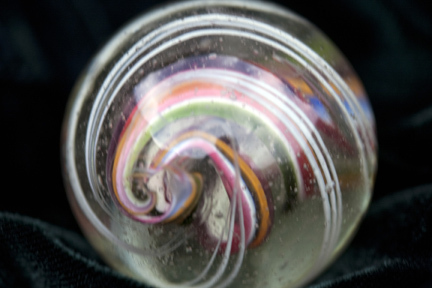 Everyone MUST keep an open mind and allow the creative process to evolve in all areas of glass. 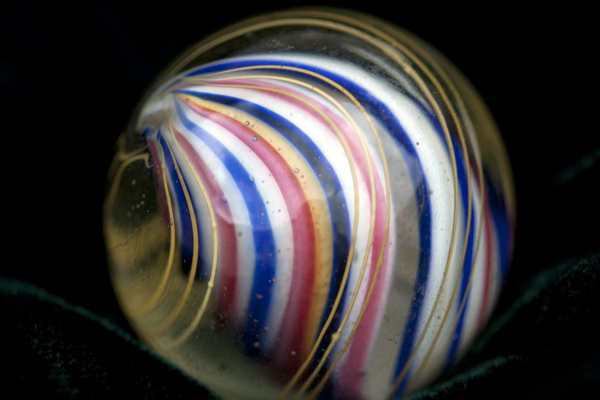 The people that make marbles today certainly can't reinvent the wheel but we sure can show different ways how to use it! Basically on this sulfide, I warmed it up at 1 degree F per minute until my kiln reached 970 degrees. I let it soak at that temperature for 2 hours hoping it wouldn't explode as the cracks and chips were really deep and it seemed that it wouldn't stand the heat, but it did. After 45 minutes at the torch at 1450 degrees F, I finally moved the little figuring off to one side while I cleaned-up the other side, moved it back using my glass techniques I learned over the 3 1/2 years, then cleaned-up the other side. Several punties during the process insured roundness. If I wanted, i could have perfectly centered the figurine but at my show, I saw all sulfides were a bit off center so I concluded this one should be a bit off too. It certainly was fun and it's my first sulfide ever thanks to Windy as she gave it to me to start with telling me, "See what you can do with this." 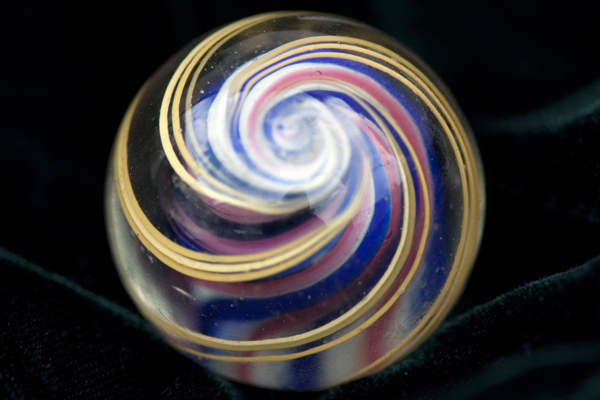 Hey, just a thought - want to see me make a soft glass marble - I am on YouTube - I'll put the link for part 1 of the 3 parts - all done in one take too! "I've heard people asking, and kept waiting with great interest for an answer." I am no expert but I'll always give giving an answer my best try for you guys. I relish with playing with glass both new and old - it's ALL good! I stayed up until 2am this morning out in my garage torching making marbles! I kinda agree - cooking isn't the way one does glass work. 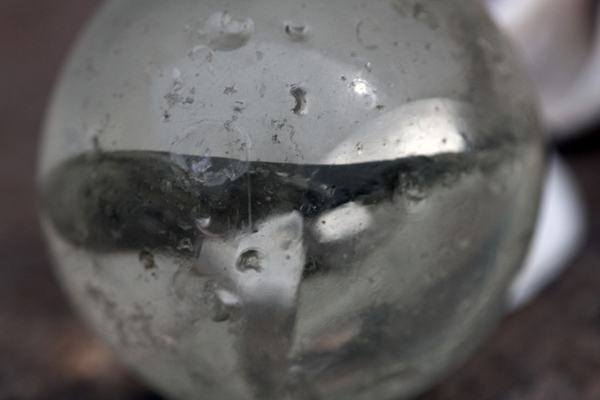 Taking the solid looking, very viscous, hard glass and adding high heat does deserve a better word like melt or remelt. 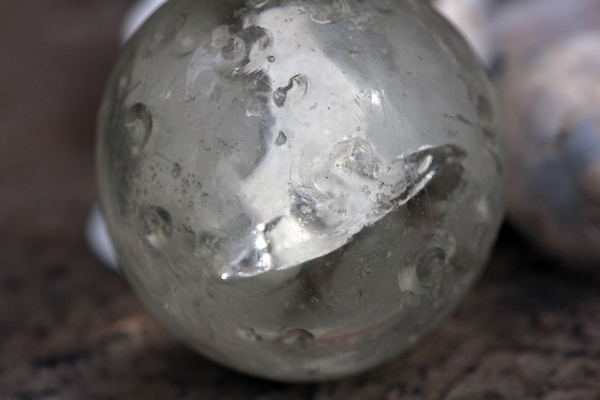 Also, we marble makers that use a torch (oxygen and propane mix) use words like gather of glass, maria of glass, football shaped glass, glob of glass, blob of glass, make a maria, make a disk, implode the disk, etc. all depending on what type of result we are looking for to get out of the rods. 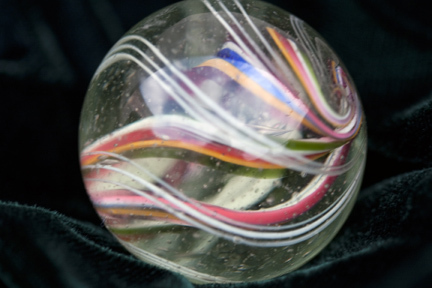 I just loved looking at the video on YouTube that someone sent me that shows how the Jabo machine made marbles are made - sometimes I wish i could be right there to see it in person - wow, now THAT would be a real thrill for me! Would you consider coming out to Wheaton this year?? We sure could use some "Successful Show" advice!! 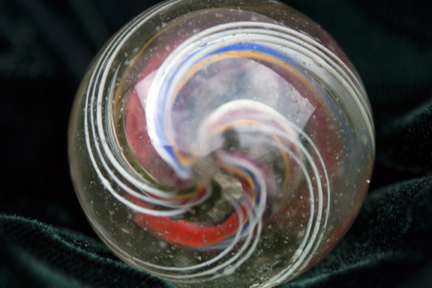 OK... Back on topic... Would this process work as well for a fractured German cane swirl marble?? I have a large fractured one that I'd be happy to send out as a trial!! 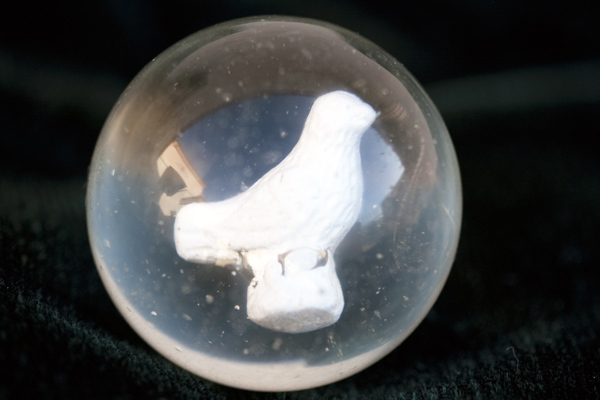 1) if the marble had any emotional value to the person, like a marble great, great granddad had the marble and now you own it, I'd not touch it but suggest instead to get a little stand and just display it where other family members could see it. The reason is because there are NO guarantees with the old glass. I don't know the COE, it might split into 100's of shards in the warming-up process, and a bunch of other reasons of what could go wrong. 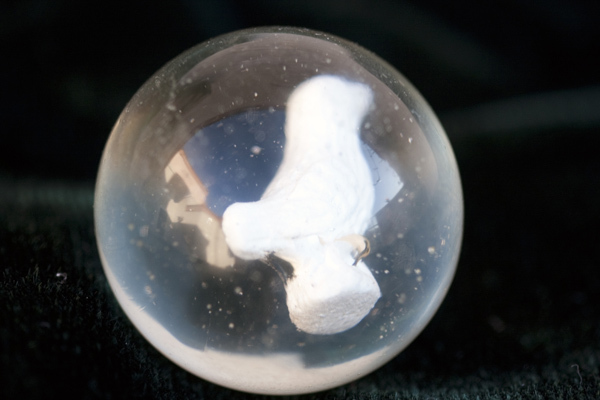 2) if the only reason is just to make a damaged marble better looking for yourself, let's play! Some things to consider are how close to the outside surface is the color design inside. If the design is close to the outer skin, well, I won't touch it because I might have to "dig" with my tools too deeply and there goes the swirl pattern! If there is enough room to work out the chips, dents and other dings, I can surely do ok with it. I have a iron clad rule - IF you give me your marble to attempt a repair, I own the marble - no questions asked. That way, if something goes wrong, you won't be mad at me! Of course I'll send the pieces back to you if you want them. 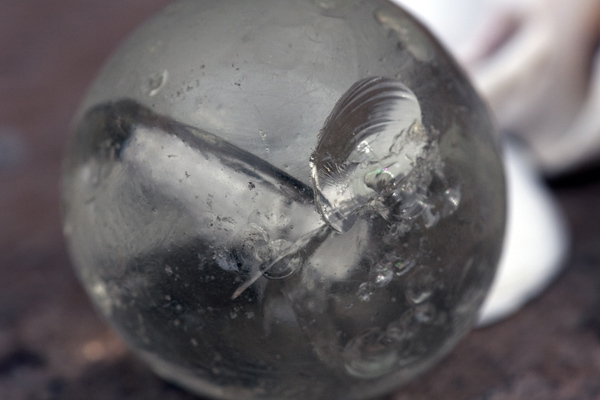 Note: out of all the marbles I have attempted to make better looking, only 3 of the 50 or so have taken a left turn and nothing I tried worked. I will repeat this - the glass will do what IT wants to do!!!!! If the repair works, I give the marble back to you and you own it again and all is well. That's amazing!!! I repair marbles myself by handpolishing them with diamond pads, but I've never seen something like you did before! 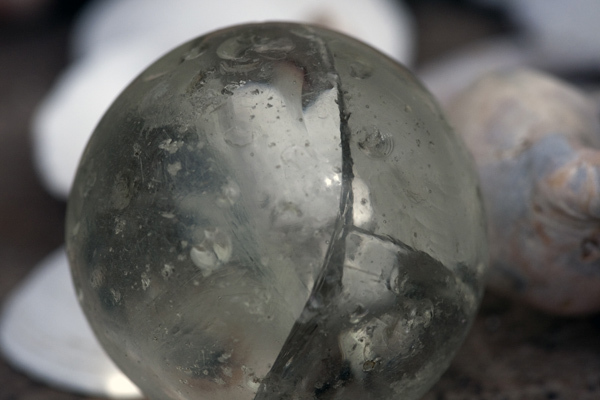 That sulphide looks beyond rescue and you made it into a lovely marble again. You even moved the figure!!! I'd love to see some more examples of your work, especially the antique swirls you repaired. ok, here are some before and after pictures of the swirl repairs I did. 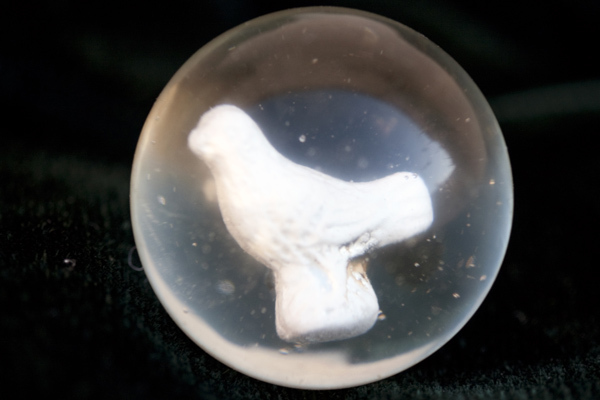 Remember, I won't touch any marble that has emotional value to the person because if it messes-up in the repair process, it is lost for good and I won't allow that to happen with me. I'll start with before pix. after pix - I spent an hour with this one! I didn't really believe it when I was working on it either - I was SO happy with it the next day when I took it out of the kiln! I agree. No way #18 and #19 are the same marble. Just for starters, #18 has groupings of three thin white bands close to the surface. Not present in #19. You are correct, I posted the wrong images as that day I repaired 6 swirls! I assure you, that marble repaired really well though. I can't show you the after pix of post #18 since the owner has it. I went back and posted the correct pictures - thanks for the heads-up!